It’s that time of year again! Many members of the MEMSAP team will be converging next week in San Francisco to present new results from our research at the Paleoanthropology Society and Society for American Archaeology annual meetings. Here is a sneak preview of two of the posters! early modern human behavior in Central Africa. Schilt, F., S. Mentzer, D. Wright, J. Thompson, C. E. Miller and E. Gomani-Chindebvu. 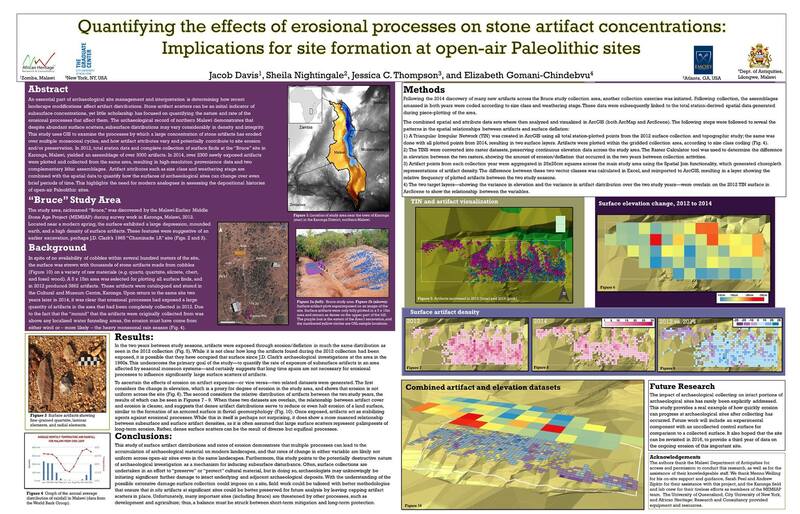 Micromorphology of Middle to Later Stone age sites in northern Malawi. Rift: context and evidence for Middle Stone Age demographic change.